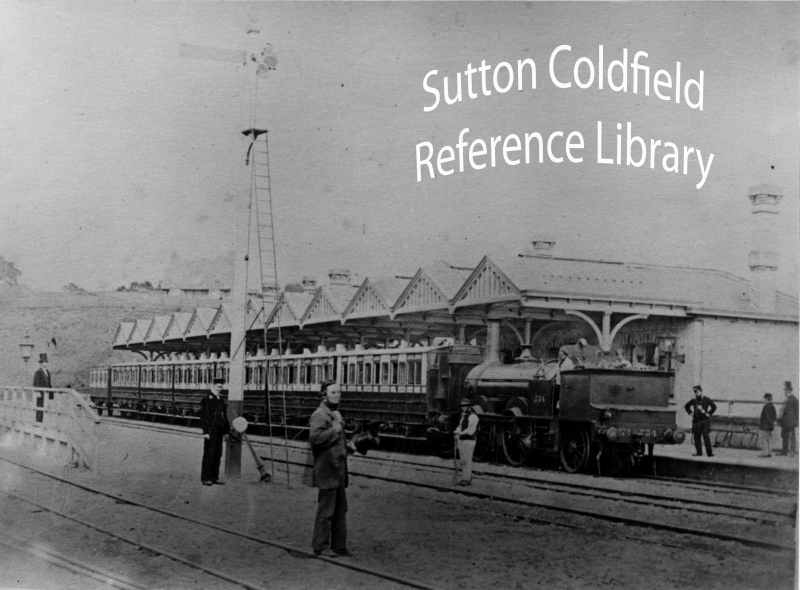 On Wednesday June 4th 1862 the new branch line of railway to Sutton Coldfield was declared open and the first passenger trains ran. Sutton was a terminus station, so the train arrived and departed from the same platform. To get to the trains you had to buy your ticket in the booking office - there were separate waiting rooms for ladies and gentlemen, where you could sit by the fire. The platform was sheltered by a handsome 160-foot canopy, and if you were travelling third class you could go along the platform to the general waiting shed, also heated by coal fires. In 1862 a single train operated a shuttle service between Sutton and Birmingham, a twenty-five minute journey, allowing fifteen minutes at each end. At the end of the line at Sutton was a turntable so that the engine could uncouple, turn round and pass the carriages along a parallel track and then reverse on to the other end of the train. Sometimes a traveller wanted his own carriage to be loaded on to the train, so the platform had a carriage dock - a small bay at right angles to the line where a carriage could be manoeuvred on to a flat truck, the truck to be attached to the end of the train. Beyond the passing line was another track serving the arrivals platform. This was where the special trains arrived, like the excursion train from Birmingham which arrived at 3 o’clock on the first day, fifteen coaches long. This was an island platform, with no buildings, which could accommodate a train on either side - in that first summer there were so many extra trains bringing excursionists to Sutton Park that all three platforms were needed. There was a crane and a goods shed in the goods yard, and also three cattle docks (Sutton was still an agricultural market town) along with a number of coal-merchants’ offices. The goods yard had four sidings. At first each point and signal was operated by a man beside it pulling a lever, but the Sutton branch was one of the first in the country to be converted to block signalling, and a signal box was erected near the Park Road Bridge. The station was further improved by the addition of refreshment rooms next to the booking office. Twenty-two years later the line was extended to Lichfield and a completely new station was built. This 1884 station is still in use, and the site of the old station with its goods yard is now occupied by the station car park. 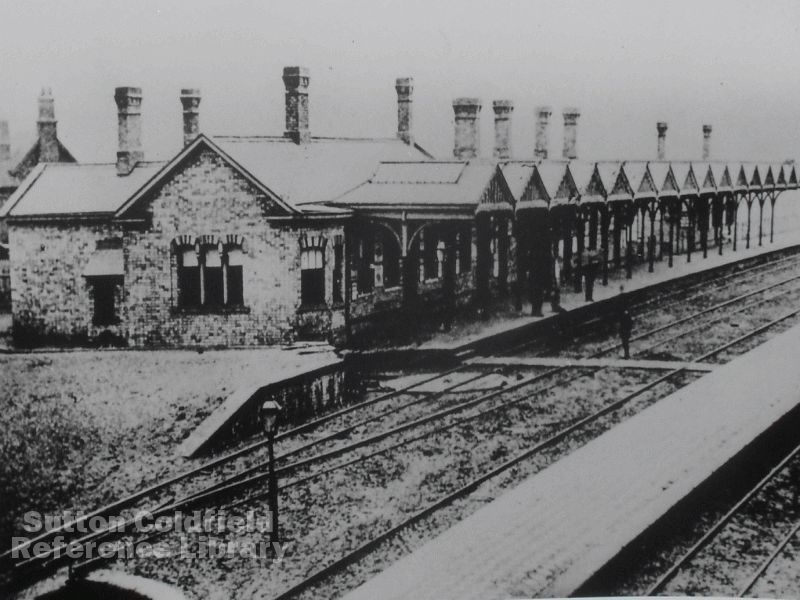 Sutton Coldfield Station c.1870. The nearest building is the newly-erected refreshment room, and the carriage dock can be seen in front of it. 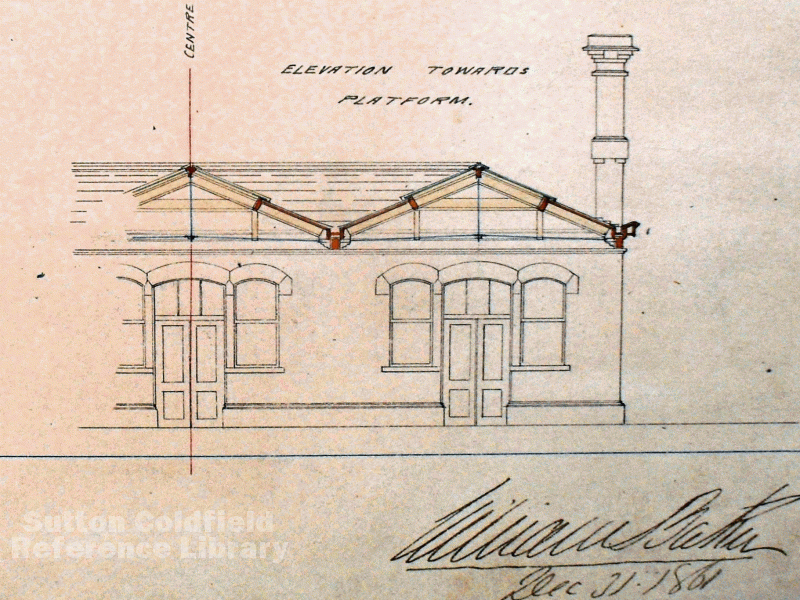 Sutton Coldfield Station c.1862. McConnell 0-4-2 tank engine no. 734 draws a train of four-wheeled coaches.